4 Tips for Barking Dogs | How to Stop Your Dog from Barking So Much! Barking comes naturally, and is considered normal activity for dogs. However, how much is too much? Your furry family member needs to understand when it is acceptable and appropriate to bark, and when it is time to be quiet, and it is your job as their fur parent to teach them! Here are 4 things you can do to quiet your dog and stop their barking habit. Most of the time, your dog is barking because he or she is simply bored. It happens! 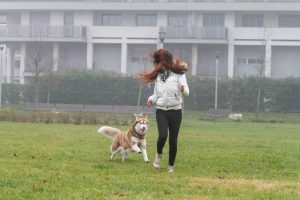 Making sure your dog gets plenty of exercise to get rid of any extra energy. Taking your dog out to the park to socialize with some other dogs and people. Giving your dog toys to keep them occupied. 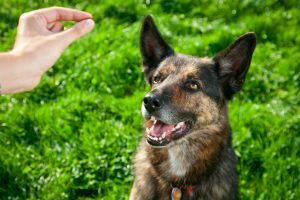 It is important to keep in mind that barking is also a joyful expression, and your dog might not realize he or she is being a nuisance. Instead of “barking back” try using a calm deeper voice to correct them! It’s near impossible to stop dogs from barking altogether – it’s in their nature, after all! But it is possible to put limits on how much they can bark, and make them aware of that limit as well! Allow your dog to bark 3-5 times before you acknowledge and correct them. While you don’t necessarily want to disallow them from seeing out the windows, if your dog has a serious barking problem when seeing people outside, it may be a smart idea to block their view while you are not home. If you notice that your pooch incessantly barks at passersby or the mailman, blocking their view can cut back their exposure to the sights and sounds that cause the barking while you’re away. When you are at home, remove the block from their view and simply repeat the other steps listed here if they do bark. 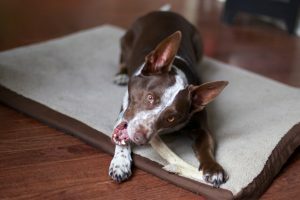 It is important to keep in mind that all dogs are different, and that no two dogs will respond the same to these tips. However, if you have tried every trick in the book and your dog is still barking, it might be time to enroll in some obedience classes! Come into our store in the Beaches and ask a member of our pack about our incredible dog trainer and obedience classes!